Long before Rube Goldberg became synonymous with crazy inventions, he was already the man behind another craze. He came up with a cute little bit he called Foolish Questions, and it caught on big. The idea was simplicity itself -- an oblivious idiot asks a really dumb question, and his victim, rather than just rolling his eyes and answering the question, shoots back a totally off-the-wall bizarre answer drenched in fresh steaming sarcasm. In Goldberg's very capable hands the concept was a goldmine of comedy. And it wasn't long before others realized that the form was relatively easy to imitate. Not necessarily imitate well, of course, as there is an art to making a really funny answer. But if imitation is the sincerest form of flattery, Goldberg was flattered all to hell and back. Here is Raymond Crawford Ewer's *ahem* homage to Foolish Questions, stealthily titled Those Ridiculous Questions to throw us off the scent. Most of Ewer's answers are on the klunky side, but it's possible to forgive him as the drawings, on the other hand, are quite delightful. Ewer was just starting in the art game at this time, but it wouldn't be long before his work was snapped up by major magazines. Alex Jay will tell us what became of Ewer tomorrow in an Ink-Slinger Profile. 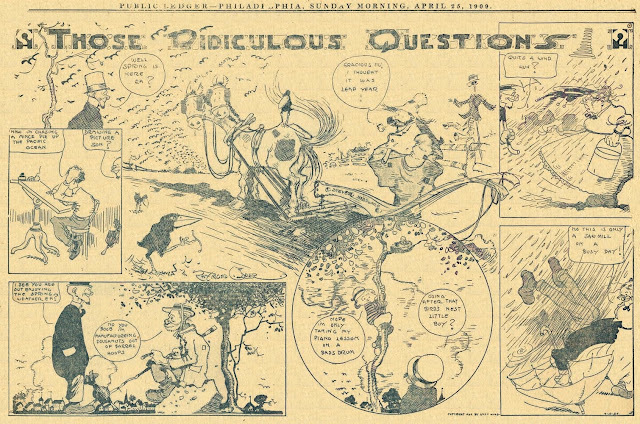 Those Ridiculous Questions ran in the McClure/Otis F. Wood preprint Sunday section starting on January 24 1909. Ewer's stint on the feature came to an end on June 20 of that year. After a several month layoff, the feature was resurrected, this time with William F. Marriner at the helm. Marriner drew the feature from September 26 to October 31. One final episode was published on November 7, which was unsigned and not by either of these cartoonists. It drives me crazy how the balloons are in backward order, so the punch line comes first. Sort of like Jeopardy...what is the straight line for this payoff? 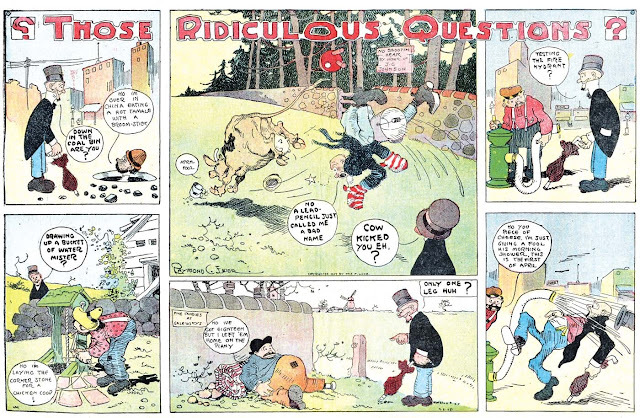 I wonder when it became standardized that dialogue in comic strips had to be placed so that it would always read left to right, unlike what this cartoonist did.